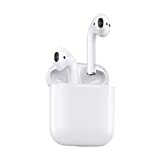 AirPods had been available on Amazon at a discount for quite some time, but they sold out a couple of weeks ago. Don’t worry though, because they’re back in stock ahead of the holidays! They’re also back on sale at a discount, which means you would have to be crazy to buy them from Apple instead of Amazon. Apple AirPods are eligible for free Prime shipping as well, so grab a pair while you can.